Once you have paid for the software download you will need to wait for an email from Yamaha Club with a link to the data download. This is usually sent to you on the day of purchase (except for weekends / holidays when the Yamaha Club office is closed). This data pack contains 32 registrations for your Yamaha AR series organ (some with style up-grades) set in the musical style of various ‘famous name’ bands, orchestras and musicians. 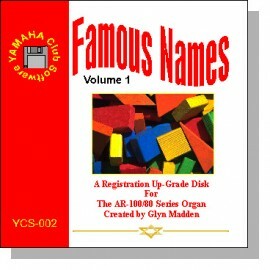 Registrations are grouped into four sets based on the following 'themes': Zamfir Pipes (Pan Flutes), Pop Piano (Richard Clayderman / Russ Conway), Herb's Band (Tijuana Brass) and Stringtime (Mantovani pop strings. The registrations are arranged on four ‘song’ tracks - but each registration set is duplicated for Fingered Chord and Custom A.B.C. playing style preferences. Should I download the software data? Downloading the data is cheaper - and is available to overseas customers - but you will need to supply your own 3.5" floppy disk and be able to transfer the data from the computer to the disk. Once you have paid for the software you will need to wait for an email from Yamaha Club with a link to the data download. This is usually provided on the day of purchase (except for weekends / holidays when the Yamaha Club office is closed). The download includes a PDF information sheet which should be opened on your computer and printed for reference. The remaining files in the download should be transferred to a 3.5" floppy disk. Or should I have the data delivered by post on a disk? Ordering the data by post is more expensive as costs (such as postage, packaging and the cost of the disk) are added to the price. Using the disk is easy because the data is on the disk ready to 'plug and play'. The package includes a basic 3.5" floppy disk and an information sheet which should be retained for reference.